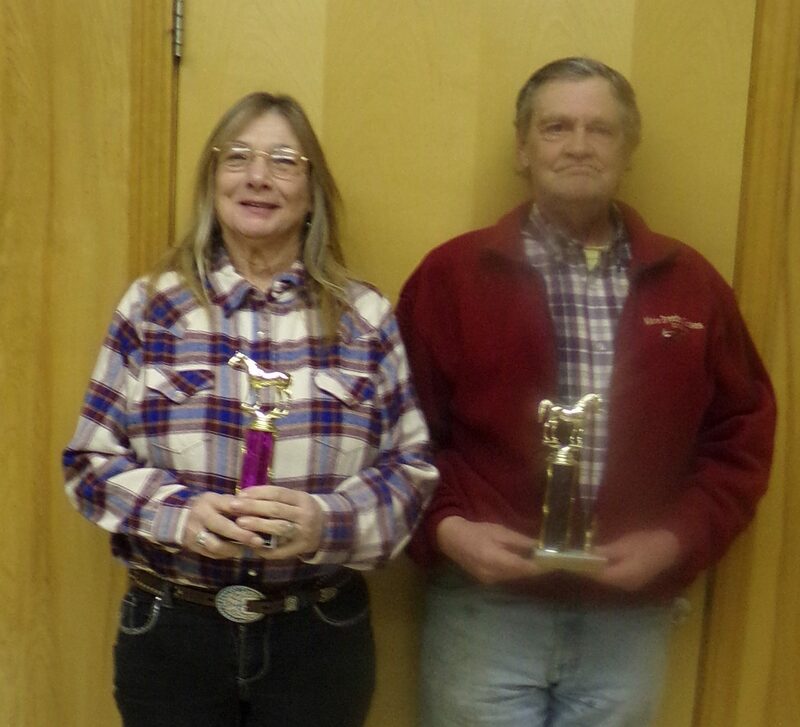 Janet Wilson and Robbie Gray received special awards at the banquet. FARMINGTON - A pot luck meal was shared before the meeting. Mike and Bob Cushing welcomed everyone and introduced Rep. Scott Landry and Rep. Randy Hall, Franklin County Animal Shelter representative Glenda Barker, Maine Breeders' representative Diane Perkins, Steve Wilson and Mike Graham. Mike Cushing President of the Maine Harness Horsemen's Association spoke on some changes going on in Augusta and will keep the horsemen informed. Hall said that the racing portion of the fair was in the black 2018 and there will be a different Midway at the fair this year. Gloria Cushing presented Jessica Clouser with a scholarship from the Farmington Horsemen Association. The money is raised by doing 50/50 during fair week. Shannon Smith spoke on the blanket program and always looking for sponsors and this year will be the 40th year. Also mention how the Cushings' sleigh ride to McDonald’s went viral and shared over 250,000 views on different Facebook sites. Mike Cushing was the auctioneer for the evening and the money raised helps with the track expenses for the year. Best 2 yr. old: Kate At The Cup owned by Jack Kelley, Erica Saucier, and Gary Mosher. Time 2:03.4. Fastest Trotter: Neverdie 9 yr. old owned by Mike Cushing, Mike Graham, and Steve Wilson. Time 1.55 lifetime record with Shawn Gray driver at Plainridge. Special awards presented by Steve Wilson and Sara Fernald. Caretaker’s Award: Janet Wilson, she started caring for race horses in the early 80’s at Lewiston Raceway for Billy Parker, 2 yrs ago she started working for Joe and Michele Mosher. She travels daily to the races during the season and always has tears of pride when the horses perform well. Service Award: Robbie Gray, he has been in racing industry for over 40 years. Starting in Lewiston in the late 70’s working for R.Parker, 90’s-2000 Gary Mosher, and he now works for Cushing’s Stables. He volunteers during Farmington Fair everyday. Good job Robbie. You’re award was very well deserved.